Temperature Coefficient of Resistance refers to how the resistance value varies due to changes in temperature. One of a foil resistor’s most important properties is Low Temperature Coefficient of Resistance, or TCR. This is especially true for applications like precision analog circuits that require tight temperature stability. A low temperature coefficient of resistance occurs in foil resistors not only because of the properties of the foil itself, the resistance of the foil will typically rise as the temperature increases. However, the difference in thermal expansion between the base material and the foil will cause a compression stress which acts to lower the resistance. Controlling and designing for these opposing effects can allow for a very stable resistor, resulting in specialized and unique construction techniques to optimize the nature of that interaction. 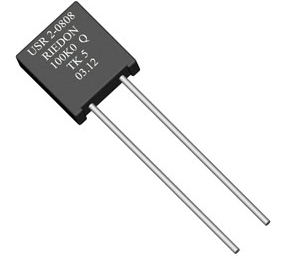 TCRs of ±0.05ppm/°C or even less are available with today’s technology such as Riedon’s USR 2-0808 series. Foil products also exhibit a low power coefficient of resistance. That is, they exhibit low self-heating due to the power they dissipate, which adds to their temperature stability. 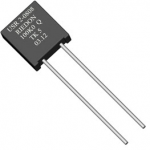 Known as thermal stabilization, this is a measure of how quickly the device’s resistance stabilizes when exposed to a change in temperature, whether that’s a result of ambient temperature changes or self-heating due to an increase in power dissipation. Foil resistors are also a clear winner over other technologies in this case, stabilizing within a few seconds, while other technologies’ response is in the order of minutes. In summary, there is far more that goes into extremely stable foil resistors than just selecting a foil. There are many foil materials available, and many substrates and the interactions of the two materials to each other must be fully understood to maximize the key performance factor of Temperature Coefficient of Resistance.